Spectacular mountain side home with large 2 story Guest house. This is truly home with all of the bells and whistles. Panoramic Ocean and Mountain Views with a big pool, next to the rancho which has a fully equipped outdoor kitchen, BBQ area that is ideal for entertaining, enjoying the breezes and watching the magnificent sunsets. This estate home was custom designed and constructed with exotic woods and stone. Open concept with lots of windows to take advantage of the rainforest, abundant nature and spectacular ocean views. This property is private and secluded. 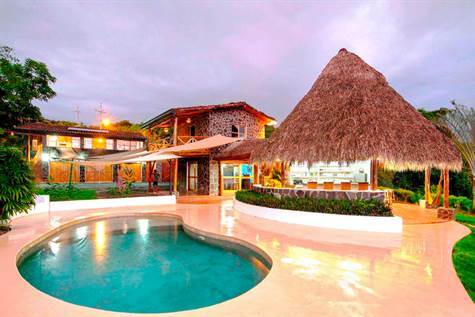 It is surrounded by nature and wildlife yet only 8 minutes to Playa Hermosa and 15 minutes to all of the amenities and nightlife of Jaco Beach. Some of the special features are: a large garage and workshop for all of your toys and hobbies, complete with a professional full size mechanics pit for working on your vehicle. Equipped with back up solar power and and a high tech alarm and security system.